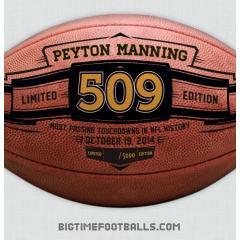 On Sunday, October 19, 2014, Denver Broncos quarterback Peyton Manning cemented his place in NFL history by becoming the All Time Leader in Touchdown Passing. Manning's four (4) TD passes in Sunday's Week 7 Game v the San Francisco 49ers moved him past Brett Favre and into the record books. 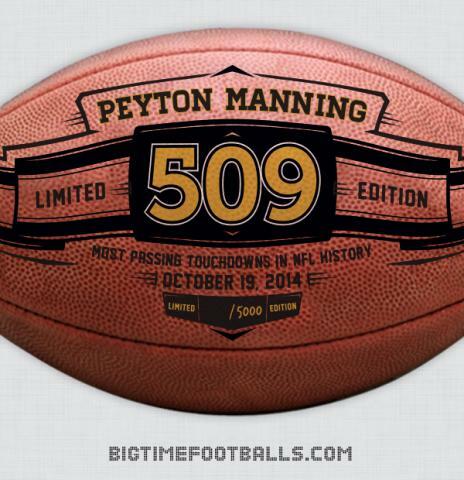 This official Wilson game ball features a special panel honoring Manning and the new NFL All Time Touchdown Passes record. It is a high-quality collectible that fans from Denver, Indianapolis, Tennessee, his home state of Louisiana and around the county would love to display in their home or office. This is an official Wilson game ball - the same ball used in NFL games - except a special panel has been added to commemorate this record breaking accomplishment. It is a limited edition offer that we expect to generate strong demand. Get yours today. Return Policy: 30 days after receipt of merchandise minus shipping and handling.